They are banned at my place and I would get a p4xl before one of those pos with sliding doors. For tesla... Note that we have the most expensive gas and cheapest electricity. For every 500$ fuel... I only need 50$ in electricity here. Range anxiety is not an issue. My wife has a Mazda CX-9. Hers is FWD but the also come in an AWD model. It's a close to a minivan as you can get without being one. It's got tons of space, and I have to admit, Mazda knows how to make fun driving machines. It drives like it's a much smaller car than it is. The transmission is always in right right gear and it has a great engine. I think the CX-9 is a good option, and honestly a good one, mainly when you think about the "chassis" setting it comes with. I have a 2015 model, and although it is a fatty 2.3 ton (metric ton) SUV, it has close to 0 understeer, the rear end is well behaive under certain demand, and the V6 (I think the new one comes with a L4 turbo) comes with good punch to back things up. As you mentioned, the gearbox is really good. The only thing I did not like about my CX-9, is the fuel consumption (city driving = 11 mpg or highway = 19 mpg) level, which I think is high... No idea, how good it would be with the L4 turbo it comes with the new model (guess it will improve greatly). I tested when purchased my CX-9, other options, as: Explorer (too loose, engine not as "punchy"), Highlander (good, but the trans did not worked that well), Pilot (did not like the "chassis" tune up). I suggest a used Suburban (LTZ or LT) or Yukon Denali. Plenty of seating and storage in the back. Plus it can double as a tow vehicle when needed:-) I swear by them, I have owned (2) 1500 Suburbans and the last one I just had (sold it last week) was a 2500 LT that was loaded. That was an awesome truck for towing and for loading up with people and stuff. I just bought a used 15 Yukon Denali XL - I like the luxury features and plus it has more HP & torque than my 2500 did. My wife is on her 3rd Acadia . We have been leasing them. It is a good people and "stuff" mover. Comfortable, decent power and gas mileage. Reasonable cost for a true "utility" vehicle. I have used it to tow a small utility trailer, once in a while. I think its rated at 3000 or 3500lbs for towing. No sliding (mini-van) door, but has about the same space, and drives more like a car. AWD is nice in the winter. Tahoe PPV. It's a truck, that still runs well, and handles like it's on rails. Low enough to load the spawn without a lot of stretching, and when they barf on the carpet, it's rubber matting that you can just mop up. Haven't they been having a lot of issues with the V6? Something to do with the timing chain IRRC. 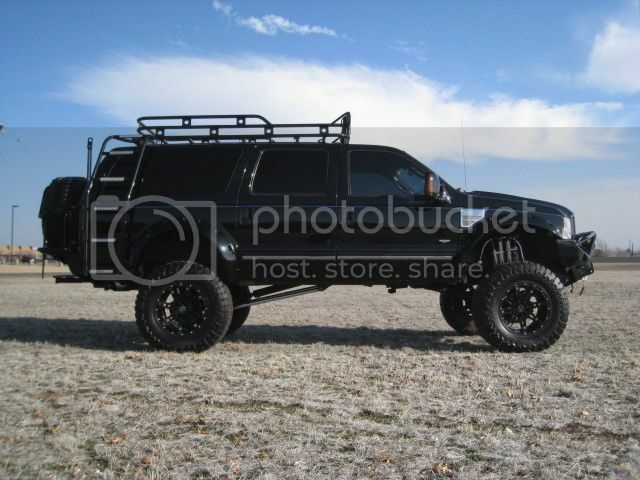 Suburban or Wrangler w/ 1000+ hp LS S/C, atlas4, tr6060, baja style suspension, armored bumpers... off road toy.